Varicose veins are enlarged superficial veins most commonly affecting the lower limbs leading to generalised discomfort. Some patients may also describe symptoms relating to significant inflammation, bleeding or ulceration. Modern venous clinical assessments include specialist venous scanning to determine the most appropriate treatment for the patient which may involve minimally invasive endovenous ablative techniques or traditional surgical ligation and vein stripping methods. Varicose veins are defined as "dilated tortuous superficial veins” which means enlarged, twisting or bendy veins that bulge close to the skin surface. Where do varicose veins occur in the body? Although varicose veins can occur anywhere in the body, they predominantly affect the legs where standing acts to increase pressure in the veins leading to increased bulging. Veins function primarily as blood vessels which bring blood back to the heart from the outer aspects of the body. As veins have less muscle than arteries, veins rely on valves instead to permit “one-way” flow of blood back to the heart. Varicose veins occur due to a weakness in the wall of the superficial veins or the vein valves themselves which leads to stretching of the vein itself and subsequent failure of one-way flow inside the vein. 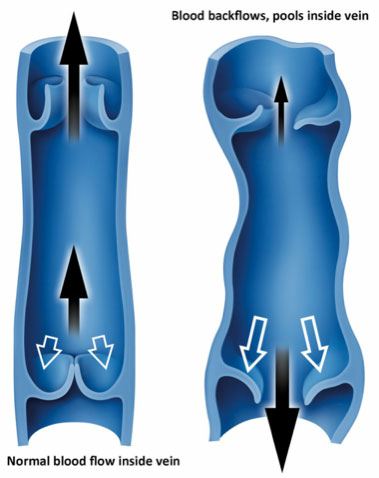 When these valves do not function normally, normal blood flow back to the heart is disrupted as the incompetent vein valve leads to reversed flow and subsequent pooling of blood in the affected extremity causing the veins to distend and bulge. Contraction of calf muscles in the lower limb when walking serves to propel blood back to the heart. Varicose veins may be more pronounced in patients working in certain occupations that require prolonged periods of standing which acts to minimise the effect of the calf muscles leading to pooling of blood. Pregnancy causes an increase in pressure within the abdominal cavity which can reduce the ability of venous blood flow return back to the heart from the lower limbs leading to an increase in varicose vein burden and subsequent pooling. Varicose veins are a very common condition affecting from 25% to 40% of the population. Patients who develop varicose veins often have a genetic tendency to developing them. Such patients may comment that other members of their family have also had varicose veins. Varicose veins occur more frequently as you get older ranging from 15% of people less than 34 years to 50% to 60% of people older than 55 years of age. Varicose veins may also simply occur without an underlying reason or may develop secondary to other conditions such as deep venous thrombosis (DVT). Where do varicose veins originate? The main sites of varicose vein valve incompetence, where superficial veins drain into the larger deep veins, are located in the groin crease called the sapheno-femoral junction and behind the knee called the sapheno-popliteal junction. The great saphenous vein (GSV) commences at the inner aspect of the ankle and travels up the inside of the calf and thigh connecting to the sapheno-femoral junction (SFJ) at the groin. The short saphenous vein (SSV) arises at the outer aspect of the ankle and travels up the back of the calf to the sapheno-popliteal junction (SPJ) at the back of the knee. Although there are a number of other sites of varicose vein incompetence, the majority of patients will present with problems at either the GSV/SFJ or the SSV/SPJ locations. What is the difference between truncal veins, reticular veins and thread veins? 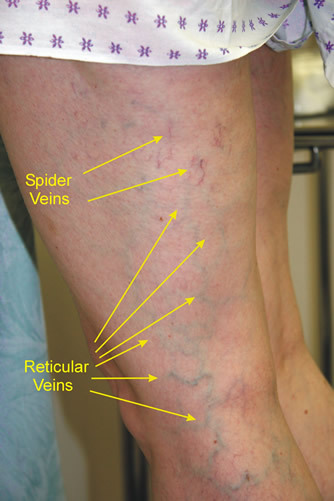 Truncal varicose veins are blue enlarged (dilated) surface (subcutaneous) veins usually greater than 3mm in diameter and often bulge outside the skin surface. Reticular varicosities are blue enlarged (dilated) veins just underneath the skin (subdermal) usually less than 3mm in diameter. Telangiectasias also known as Thread or Spider veins are smaller red or purple veins within the skin (intradermal venules) usually less than 1mm in diameter. What symptoms do people with varicose veins get? However, you may simply not like the look of your varicose veins which your vascular specialist can advise on potential treatments and expected cosmetic outcomes. Unfortunately, such cosmetic treatments are not routinely available on the NHS. All of these five lower limbs have varicose veins compared to the normal leg on the far right. The picture also represents a stepwise increase in varicose vein severity according to the CEAP classification of chronic venous disease. What is the CEAP Classification? The CEAP Classification of chronic venous disease is a grading system designed to assist clinicians communicating with each other and creates a useful mechanism for classifying venous disease severity for vascular specialists involved in clinical research. 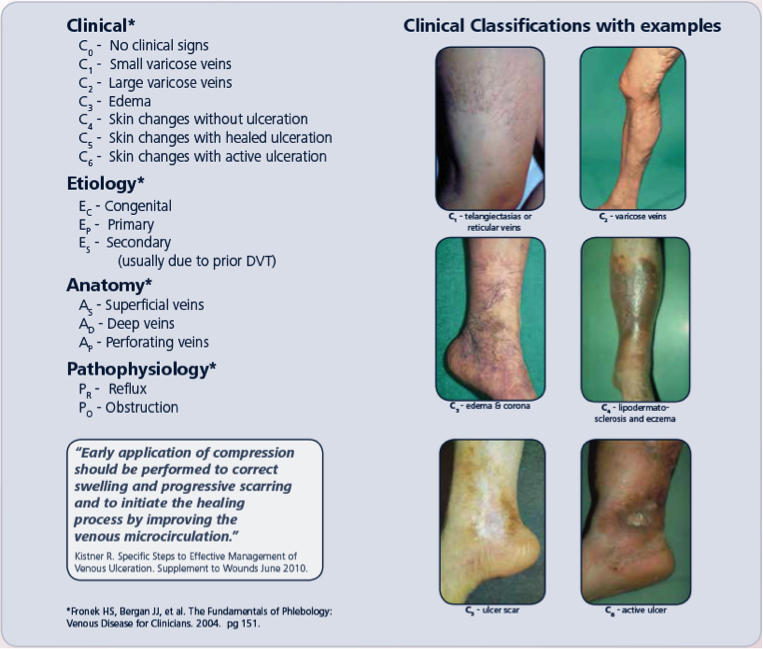 Clinical – how your varicose veins may be described following clinical examination. Etiology – how you varicose veins may have occurred. 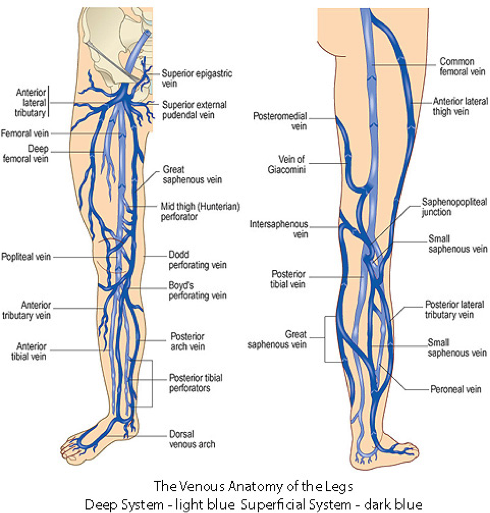 Anatomy – the anatomical problem associated with your varicose veins. Pathophysiology – the actual mechanism or underlying disease process that has caused your varicose veins and chronic venous disease. The CEAP classification of chronic venous disease severity is also incorporated in the latest NICE (National Institute of Clinical Excellence) Guidelines for the Diagnosis and Management of Varicose Veins. What are the risks of varicose veins? Thrombophlebitis affecting a patient’s varicose veins remains common with an incidence of 125,000 new cases per year in the United States. Patients may describe redness (erythema), increased warmth, tenderness, swelling and a palpable thickened area which feels like a cord. Clinical assessment and ultrasound examination are often warranted to exclude the presence of associated deep vein thrombosis (DVT) which may occur in approximately 15% of patients. Most patients are treated with conservative measures including oral pain relief and anti-inflammatories (if it is safe for you to take these medications) followed by compression hosiery once the pain has subsided. If you feel unwell with an associated high temperature and shivering, you may require a course of antibiotics. However, this is quite rare. Bleeding from varicose veins is probably a more common occurrence than traditionally suspected. Minor skin bleeding may be related to the scratching of very itchy or eczematous areas adjacent to a patient’s varicose veins. These superficial abrasions do not usually cause significant bleeding and may simply just stain clothes. Avoidance of scratching, topical emollient skin creams followed by a specialist vascular assessment to evaluate your lower limb varicose veins is warranted. More significant bleeding can occur in older patients with thin-walled enlarged veins on the inner aspect of the lower calf and ankle region. Such bleeding due simple trauma or from scratching can be quite profuse. It is advised to place pressure over the area with a dressing or even an item of clean clothing and then try and lie with the leg elevated to reduce pressure within the vein that is bleeding. Attendance at an emergency department may occasionally be required followed by subsequent referral to a vascular specialist. Direct suturing of the area that is bleeding is not usually recommended as this can lead to delay in healing or even venous ulceration. Your vascular specialist may suggest endovenous ablation treatment of the main vein segment which has increased pressure in the vein that was bleeding. Sclerotherapy provides an alternative option to prevent further bleeding. Although clinical evidence has clearly documented reduced quality of life scores in patients with varicose veins, your vascular specialist will try to evaluate the risk of your varicose veins progressing to varicose ulceration which in most cases is quite low. A higher risk of varicose ulceration, which can be extremely painful and slow to heal, is present in patients with varicose eczema , haemosiderin deposits and lipodermatosclerosis as shown in the figure to the right. All of these clinical signs may suggest that chronic venous insufficiency is developing. Your vascular specialist will discuss conservative measures such as weight loss, exercise and support stockings to help to reduce your risk of developing chronic venous insufficiency as well as evaluate whether you require endovenous treatment of your varicose veins. Patients with a previous history of healed varicose ulceration are always at risk of ulcer recurrence. What happens when I attend my vascular specialist with varicose veins? After your clinical evaluation, your vascular specialist will discuss your clinical condition with you and will present the available treatment options. At this stage, the benefits and risks of the possible interventions will be described. You do not have to commit to any specific procedure at this stage. You can arrange a review appointment to discuss any issues you have prior to committing to any procedure. The Patient Journey section of this website details the complete patient path from initial consultation through to procedural care and post-operative clinical review. Why is it important to see a vascular specialist about my varicose veins? A vascular specialist is trained to evaluate your symptoms, examine your lower extremities both clinically and radiologically using duplex ultrasound to identify evidence of underlying venous incompetence prior to discussing an individualised treatment plan with you. A vascular specialist will have been trained in all aspects of modern varicose vein care including minimally invasive endovenous modalities, traditional open surgical approaches and a range of sclerotherapy techniques for treatment completion. A vascular specialist will continually appraise new and innovative therapeutic techniques to provide optimal outcomes for their patients. Can I still have treatment if I have had varicose vein surgery in the past? Yes - Recurrence of varicose veins following previous surgery can occur. Modern vein assessment by a vascular specialist provides both a clinical and radiological examination during your initial consultation which can identify the likely cause of your varicose vein recurrence. Once you assessment is complete, your vascular specialist will then discuss therapeutic options in your personalised treatment plan. Minimally invasive endovenous procedures are often very well suited for patients with recurrent varicose veins. However, your vascular specialist may consider whether redo-operative surgery may be a more optimal solution. Vein valve incompetence of the main venous channels such as the great (GSV) and short (SSV) saphenous systems is predominantly treated with minimally invasive endovenous ablative techniques. Reticular veins may be treated with foam or plain sclerotherapy while spider veins normally require plain microsclerotherapy only. Operative treatment of varicose veins is usually reserved for patients with primary or recurrent varicose veins not amenable to endovenous modalities particularly if they are extremely tortuous or if there is a significantly large volume of varicose veins present. The Patient Journey and Videos sections of this website provide further information regarding varicose vein treatments provided by Professor O’Donnell. Do topical creams remove varicose veins? Currently there is no published evidence to recommend any topical cream for the removal of varicose veins. Patients with chronic venous insufficiency are advised to apply topical emollients to moisturise the skin which acts to protect it. Expensive products have not shown any significant enhanced benefit compared to Diprobase, E45 or equivalent creams. Are there any medical treatments to remove varicose veins? Currently there is no published evidence to recommend any oral tablets for the treatment or removal of varicose veins. What are minimally invasive endovenous ablative techniques? Minimally invasive endovenous ablative techniques treat your varicose veins under local anaesthetic without the requirement for an operation under general anaesthesia. A vascular specialist uses an ultrasound machine to identify your varicose veins and then inserts a device into the vein to effectively “heat-treat” the vein. This causes the vein to scar resulting in the cessation of refluxing blood filling your varicose veins. Your vascular specialist will not need to make any major cuts or incisions in your leg. Specific types of endovenous treatments available include Radiofrequency Ablation, Endovenous Laser Ablation, Mechanical Ablation and Glue Treatments. These treatments are described by Professor O’Donnell in the Video Section of this webpage. Do I need to be admitted to hospital for minimally invasive endovenous treatments? Minimally invasive endovenous treatment are performed as a day case procedure where “you – the patient” simply walk-in then walk-out following your treatment. Does my vascular specialist remove the vein during the minimally invasive endovenous procedure? It is important to realise that these minimally invasive endovenous ablative procedures do not remove your vein like traditional surgery does. Your specialist is simply using focussed modern techniques to stop blood refluxing in your leaky vein thereby improving your symptoms and quality of life. What are the risks of minimally invasive varicose vein interventions? During your procedural consent process, your vascular specialist will advise you that endovenous ablation of the great and/or short saphenous system +/- varicose vein avulsions is being performed to minimise discomfort, reduce lower limb skin changes secondary to venous disease and risk of venous ulceration. Specific risks and complications will then be discussed. Bruising – can occur after any procedure. Usually causes some localised tenderness and settles completely after 6 to 8 weeks. Bleeding – your vascular specialist will take particular care to minimise any bleeding during your minimally invasive endovenous procedure. Sometimes slight ooze from some of the local anaesthetic injection sites in the lower limb can occur. If this happens, you are advised to sit or lie down, elevate your leg and apply pressure to the site of ooze with a wad of tissues for at least 5 minutes. The ooze normally settles. After all your wounds have been lavaged, dressings are applied followed by compression hosiery to try and compress your lower limb to minimise both bruising and bleeding. Pain – it is natural to have some discomfort after any procedure. Local anaesthetic administered during minimally invasive endovenous treatment means that you will usually have no discomfort in the initial period following your procedure. However, local anaesthetic will start to wear off 4 to 6 hours after administration. Professor O’Donnell will advise you to take your normal pain relief medication you have at home (what works best for you) following your procedure 4 times a day for approximately 2 to 3 days. As a reminder it is advised to take your pain medication with every meal and just before you go to bed. Do not wait for any discomfort to occur as the local anaesthetic wears off before you start your pain medication. Wound Infections – your vascular specialist will pay particular attention to minimising your risk of wound infections (< 3-4%). If you notice redness, discharge or develop a temperature it is important to report this to your practice nurse / general practitioner or contact the hospital where you had the procedure performed. Most wound infections can be treated conservatively with good nursing care, dressings if required and antibiotics. Early treatment is vital to minimise the risk of the infection progressing deeper which fortunately remains quite rare after minimally invasive endovenous surgery. Haematoma – this is essentially a large bruise with associated swelling that can occur close to your treated vein. Similar to a bruise it normally settles without any additional care but may take a little longer. Some patients may also feel a thickening or “cord-like structure” where the vein was treated which is essentially the scarred down main vein which no longer has blood flow. Nerve injury / Numbness – sometimes the saphenous nerve which is located on the inside of the knee can get bruised during your procedure creating an area of numbness just above and below the knee itself. This may occur in approximately 5% to 10% of patients. However, most of these affected patients (90% to 95%) will have resolution of the numbness 6 to 12 months following their procedure. Your vascular specialist will also try and minimise any potential nerve bruising or damage by specifically treating only the area above your mid-calf to minimise the risk of nerve and muscle injury below this level. Phlebitis – Occasionally (5-10%) patients may develop marked inflammation around the treated vein which results in discomfort and lumpiness called phlebitis. Symptomatic relief is provided through taking oral anti-inflammatories such as ibuprofen if it is safe for you to take this. If you become feverish and unwell, you may require a short course or oral antibiotics as well. Scar – a vascular specialist will try and minimise any scarring from your endovenous procedure. The small entry point of the treatment sheath may leave an extremely small scar which often fully heals over. Skin Staining – this remains infrequent (<1%) with more modern technological developments. Skin staining or tattooing can occur as a result of the endovenous treatment heating blood within the vein which can then leech out into the surrounding tissues. Your vascular specialist will try and minimise this through identification of varicose veins close to the skin surface and instilling extra local anaesthetic tumescence to push the vein deeper and away from the skin. If skin staining or tattooing occurs, 90% of cases resolve within a year and most of the other patients resolve at 1 year. Very rarely is additional skin laser treatment required to vaporise out the brown skin staining. Varicose Vein Recurrence – modern ultrasound targeting of specific varicose veins for endovenous treatment has revolutionised the care of our patients. However, despite your vascular specialist’s focused treatment it is recognised that varicose veins can come back over the foreseeable future. Current radiofrequency ablation recurrence rates are approximately 5% to 9% at 5-years. 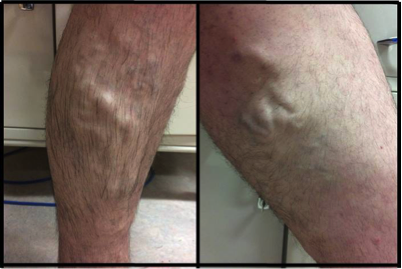 However, some of these recurrent veins are minimal and not all patients request further treatment. Thromboembolic – any procedure may increase the risk of developing a deep venous thrombosis (DVT) which is less than 1% with endovenous treatment. Your vascular specialist will try to minimise your risk with precise surgery to reduce your time period on the operating table and will check to ensure that the vein segment being treated is the superficial varicose vein and not one of your deeper veins. All patients are actively encouraged to walk following their procedure and continue to remain active throughout their recover. Minimising your risk of DVTs is important to minimise the risk of clots travelling to your lungs which are called pulmonary emboli (PE). Some patients at higher risk of a thromboembolic event may require a blood thinning injection at the same time at their procedure. Minimally invasive endovenous procedures under local anaesthetic have a low risk (<1%) of significant cardiac, respiratory or renal complications. What other issues will my vascular specialist discuss during my treatment consultation? Although a vascular specialist will utilise modern endovenous techniques to treat your varicose veins, it is important to realise that not all veins may be removed during your initial procedure. Your vascular specialist may advise the need for additional treatment on a different date with foam sclerotherapy, avulsions or “touch-up” sclerotherapy. Most patients with significant symptoms from their varicose veins describe an improvement post-procedure. However, some patients may still describe occasional ache in their lower extremities which may have a different cause such as muscular or joint discomfort. Sclerotherapy is the treatment of varicose veins by the injection of an irritant which causes inflammation, coagulation of blood and narrowing of the blood vessel wall. This causes the vein to scar forcing blood to re-direct through healthier veins. The treated collapsed vein is eventually reabsorbed into local tissue and then fades over the following weeks and months. A sclerosant solution is mixed with a gas to create a foam or mousse. The foam is subsequently injected into the vein which acts to completely fill the vein and push blood out of the way. The inner lining of the vein is damaged making it sticky. Blood subsequently sticks to the scarred vessel and blocks it off leading to a reduction in refluxing blood. Preparation of foam requires a lower volume of the active sclerosant solution for the same clinical effect. Foam sclerotherapy tends to be reserved for the treatment of truncal or reticular veins. Plain sclerotherapy is the administration of an irritant directly to the required treatment area. Clinicians will use a more dilute concentration for the treatment of spider or thread veins (microsclerotherapy). What does operative varicose vein surgery involve? 1) Junctional Ligation - interruption of blood flow from the leaky incompetent superficial vein to the deeper veins which requires a skin incision at the groin or at the back of the knee followed by careful dissection down to the junction where the superficial veins meet the deeper veins. All these connections are subsequently divided and tied off with sutures by the vascular surgeon. 2) Stripping of the Remnant Great Saphenous Vein (GSV) - debulking or removal of as much of the residual GSV left in the thigh after ligation of the sapheno-femoral junction (SFJ) to a level above or just below the knee. 3) Avulsions / Phlebectomies - completion of a number of micro-incisions throughout the lower extremity where the varicose veins have been marked pre-operatively followed by removal of these veins with specialised vascular hooks. Please see Current Management Strategies for Lower Limb Venous Disease and Lymphoedema on the Video Section of this website. What are the risks of operative varicose veins surgery? During your procedural consent process, your vascular specialist will advise you that exploration of the groin and ligation of sapheno-femoral junction +/- great saphenous vein stripping +/- varicose vein avulsions/phlebectomies is being performed to minimise discomfort, reduce lower limb skin changes secondary to venous disease and risk of venous ulceration. A similar process is completed for ligation of the sapheno-popliteal junction which normally does not require short saphenous vein stripping. Specific risks and complications will then be discussed. Bruising – can occur after any procedure. Usually causes some localised tenderness and settles completely after 6 – 8 weeks. Bleeding – your vascular specialist will take particular care to minimise any bleeding during your surgery. After all your wounds have been sutured, dressings are applied followed by compression hosiery similar to endovenous surgery to try and compress your lower limb to minimise both bruising and bleeding. Pain – it is natural to have some discomfort after any procedure. Although the procedure is performed under general anaesthesia, your vascular specialist will also administer local anaesthetic to your wound to try and minimise any pain. You will also need to take pain relief medication when you get home following your procedure. Professor O’Donnell recommends you to take your normal pain medication you have at home 4 times a day for approximately 2 to 3 days. As a reminder it is advised to take your pain medication with every meal and just before you go to bed. Do not wait for any discomfort to occur as the local anaesthetic wears off before you start your pain medication. Wound Infections – your vascular specialist will pay particular attention to minimising your risk of wound infections (< 3-4%). If you notice redness, discharge or develop a temperature it is important to report this to your practice nurse / general practitioner or contact the hospital where you had the procedure performed. Most wound infections can be treated conservatively with good nursing care, dressings if required and antibiotics. Early treatment is vital to minimise the risk of the infection progressing deeper which fortunately remains rare even after open varicose vein surgery. Haematoma – this is essentially a large bruise with associated swelling that can occur close to your treated vein. Similar to a bruise it normally settles without any additional care but may take a little longer. Some patients may notice bruising tracking down the inside of their thigh or may feel a thickening or “cord-like structure” where the vein was stripped. Nerve injury / Numbness – sometimes the saphenous nerve which is located on the inside of the knee can get bruised during your procedure creating an area of numbness just above and below the knee itself. This may occur in approximately 5% to 10% of patients. However, most affected patients (90% to 95%) will have resolution of the numbness 6 to 12 months following their procedure. Your vascular specialist will also try and minimise any potential nerve bruising or damage by only stripping the great saphenous vein to only just below the knee level. Phlebitis – inflammation at the site of varicose vein avulsions/phlebectomies can occur occasionally (<5%) which may cause localised discomfort or lumpiness. Symptomatic relief is provided through taking oral anti-inflammatories such as ibuprofen if it is safe for you to take this. If you become feverish and unwell, you may require a short course or oral antibiotics as well. Scar – a vascular specialist will try and minimise any scarring from your surgical procedure and will commonly close any wound with invisible (subcuticular) sutures. Varicose Vein Recurrence – Despite optimal treatment by your vascular specialist, it is recognised that varicose veins can come back over the foreseeable future. Current open operative recurrence rates are between 10% and 20% at 5-years. However, some of these recurrent veins are minimal and not all patients request further treatment. Thromboembolic – any procedure may increase the risk of developing a deep venous thrombosis (DVT) which is less than 1% with traditional operative treatment of varicose veins. Your vascular specialist will try to minimise your risk with precise surgery to reduce your time period on the operating table. All patients are actively encouraged to walk following their procedure and continue to remain active throughout their recover. Minimising your risk of DVTs is important to minimise the risk of clots travelling to your lungs which are called pulmonary emboli (PE). General anaesthetic procedures for varicose veins have a low risk (<1%) of significant cardiac, respiratory or renal complications. Although your vascular specialist will have already evaluated your current medical fitness and past medical history, your anaesthetist will further evaluate you to assess your overall fitness for the procedure and if it is still safe to proceed. What are the success rates with varicose vein treatment? Most, if not all patients, are very pleased with the results of their varicose vein intervention and make a full recovery with complete resolution of post-procedural bruising in a period of weeks and resolution of any scars, which gradually fade away, around 6 months following their procedure. The majority of patients report an improvement in their symptoms following varicose vein treatment. However, it is important to realise that not all lower extremity symptoms may be entirely attributed to varicose veins and despite a successful procedure some patients may describe a persistence of original symptomatology. Varicose veins which have been removed do not come back. However, veins in your lower limb that are currently normal may become varicose in the future. A specialist vascular assessment and subsequent treatment can help to reduce the future risk of recurrences. Minimally invasive varicose vein treatment has been available for nearly 20 years. Current research has reported recurrence rates less than 10% over a five-year follow-up period. Traditional surgery has reported slightly higher long-term recurrence rates between 10% and 20%. Although varicose veins may recur, it is important to realise that such recurrences may actually be quite minor and not require any further active treatment. I have chronic venous insufficiency – will my skin return to normal after varicose vein treatment? Although the clinical presence of skin changes associated with chronic venous insufficiency are usually deemed permanent, varicose vein treatment may help overall skin condition, minimise disease progression and aid ulcer healing. A vascular specialist’s treatment priorities are different when treating patients with chronic venous insufficiency where emphasis is placed on trying to minimise the risk of ulcer occurrence or recurrence. What are varicose vein avulsions / phlebectomies? Varicose vein avulsions also known as phlebectomies involve the completion of a number of micro-incisions throughout the lower extremity where the varicose veins have been marked pre-operatively by your vascular specialist. Following the micro-incision, a specialised “Oesch” vein hook is inserted to remove the varicose vein segment. Varicose vein avulsions may be performed at the same time as endovenous ablation treatment after infiltration of local anaesthetic or during traditional operative vein surgery under general anaesthesia. What happens before my varicose vein procedure? Once you have been scheduled for your procedure, the relevant hospital will inform you of all required details regarding your attendance. Your procedure is commonly performed as a day case. However, if you have any medical problems, you may require an overnight hospital stay. What happens on the day of my varicose vein procedure? On admission to the hospital ward, a nurse will take details about you for completion of your individualised treatment care plan. You will then have completion of basic clinical observations such as your temperature, pulse and blood pressure. You will then be requested to wear a hospital gown in preparation for your procedure. Your vascular specialist will then examine you prior to your actual treatment to address any questions you may have and confirm the specific treatment you will undergo. At this stage, all aspects of the procedure will be discussed and you will be requested to confirm your agreement by signing the consent form. Finally your lower extremity varicose veins will be marked with a marker pen. Professor O’Donnell will then ask you to look at the marked areas on your lower limbs to confirm inclusion of all the areas that you wish to have treated and to identify if any additional areas require treatment. What types of anaesthetic are available? The majority of varicose vein interventions are performed as day-case procedures under local anaesthetic. Local anaesthetic vein procedures do not require a period of fasting. Although you should be able to take all of your normal medications, it is important that you have previously informed your vascular specialist and the hospital where you are having the procedure of your current medication prescription particularly blood thinning medications. Administering local anaesthetic does require the use of a small needle to numb the skin for the initial insertion of the vein treatment device. Subsequent passage of this device does not cause any discomfort. Your vascular specialist will then need to administer local anaesthetic to the surrounding area of the vein being treated to both numb this area and protect the surrounding tissues prior to commencing treatment. This usually requires a further 4 to 5 injections. General anaesthetic procedures are often indicated for very tortuous varicose veins which would not normally permit passage of the radiofrequency catheter or in certain patients with a significant volume of varicose veins which would not be suitable for local anaesthetic treatment. General anaesthetic procedures do require a period of fasting. Your surgical and anaesthetic teams will need to review your medications and determine which of your regular medications you should take on the day of your surgery. Local anaesthetic will also be used in those patients undergoing operative intervention under general anaesthesia to minimise any discomfort in the immediate time period following your surgery. Following your procedure, your treated limb will be lavaged. Small paper stitches (steri-strips) and adhesive dressings are applied to your treated lower limb. Compression hosiery (stockings) are then applied to your treated limb which are used to improve your clinical outcome following your intervention. These stockings can be slightly challenging to put on initially due to their snug fit – however this is exactly what we want. You will then be taken to the recovery area for some light refreshment. At this stage, we will make sure you are fully mobile before your day case discharge. Do I need pain medication following my discharge? As discussed during your pre-operative consultation, you will usually leave the hospital completely pain-free as your local anaesthetic is still effective. However, this will wear off approximately 4 to 6 hours following your procedure. Do not wait for the onset of discomfort after the local anaesthetic has worn off completely before you take pain relief medications. Professor O’Donnell advises you to ensure that you take your preferred oral analgesia tablets that work for you with every meal (breakfast, lunch and dinner) and before you go to bed to prevent you getting sore. Please start taking your pain relief with your next meal after your procedure. You should only require oral analgesia four-times a day for approximately 2 to 3 days. Will I need to have any stitches removed? Minimally invasive endovenous interventions do not normally require stitches. If you had traditional varicose vein surgery, you will have dissolvable stitches in your groin wound and/or knee wound. Avulsion / phlebectomy micro-incisions are closed using paper stitches (steri-strips). How long do I keep the compression hosiery on for? The compression hosiery should not be removed for the first 48-hours. After this period, you may remove them for a shower. The steri-strips and dressings often fall off in the shower and this is normal. You then need to immediately re-apply the compression hosiery which is to be worn day and night for one week. Most patients will be quite “fed-up” with the constant application of compression hosiery after this week but it remains important to persist with their usage to improve your clinical outcome and minimise complications. What happens if I notice any ooze coming through the dressing on my lower limbs? Very occasionally, there may be some ooze from some of the local anaesthetic injection sites in the lower limb. If this occurs, you are advised to sit or lie down, elevate your leg and apply pressure to the site of ooze with a wad of tissues for at least 5 minutes. The ooze normally settles. What happens in the first few weeks following my procedure? Most patients will describe an ache in their lower limb following varicose vein treatment which will be attributed to the procedure itself and the subsequent healing process. There may be tenderness, lumpiness and bruising over the inner thigh and calf for first couple of weeks which is normal and usually settled completely. Your vascular specialist will want you to continue with your normal daily activities and remain active, gradually increasing overall activity and walking until you are fully mobile to minimise your risk of a deep venous thrombosis. You should avoid standing still or sitting with your legs down for the first week. Do I need compression hosiery after the post-operative week has finished? Professor O’Donnell normally recommends the continuous use of compression hosiery for 7 days following your varicose vein procedure. Most patients do not require the use of compression hosiery after this period. However, patients with chronic venous insufficiency need to continue with their skin care regimen and compression hosiery is often required life-long. I tend to stand a lot in my job and am wondering if compression hosiery would help? Yes – compression hosiery can ease the generalised heavy feeling that some patients describe at the end of the day particularly if they have to stand for significant periods. Most patients can attend their pharmacist or local chemist for the provision of compression hosiery / stockings. It is important that you are properly measured and ensure the hosiery / stockings fit properly with no slippage or wrinkling. Work - Most patients return to work quite quickly after varicose vein treatment. However, this is quite dependent of what your actual occupation is particularly in relation to the physical demands and expectations of your job. You should return to work when you feel sufficiently well, comfortable and able to perform the required roles associated with your job. Following minimally invasive endovenous treatment, you may require a few days to a week whereas traditional open surgery may warrant 1 to 2 weeks to recover. You may also wish to return to work with light duties for the initial period if required. Driving - You can drive as soon as you can apply emergency brakes without hesitation. This can vary between patients and may even be possible the following day after your procedure. Sports – Professor O’Donnell will advise you to remain as active as you can. As the procedure can result in some bruising, most patients tend to return to full sporting activities when the bruising has settled which can take between 2 and 6 weeks. It is advised to gradually increase your levels of activity. Am I allowed to fly following my varicose vein treatment? For two weeks after the procedure for short flights up to two hours. For four weeks after the procedure for middle distance flights. For six weeks after the procedure for long haul flights. Clinical follow-up after varicose vein procedures vary considerably between regions ranging from no follow-up to a clinical review between 6 and 12 weeks post-procedure to discuss your treatment and assess your recovery. Occasionally this post-operative review will be earlier at approximately 2 weeks if you have had foam sclerotherapy performed to determine if aspiration of haematoma (blood) from the treated segment is warranted to improve your clinical outcome. Do I need any scans after my varicose vein procedure? Most vascular specialists do not arrange routine post-procedural scans following varicose vein treatment unless clinically indicated in the presence of a deterioration or wound concern. Are varicose veins treated on the National Health Service? The National Institute of Clinical Excellence has provided guidance regarding how varicose veins can be treated in the National Health Service. However, varicose veins referral and treatment protocols vary between regions. In Northern Ireland, the Health Board has provided guidance that only patients with significant varicose veins with a history of oedema, phlebitis, bleeding and ulceration will be offered treatment on the NHS. Certain other restrictions have also been placed including a requirement for previous prescription and use of compression hosiery. Can microsclerotherapy for reticular or spider veins be performed on the National Health Service? No – such treatments are considered cosmetic. Spider and reticular vein treatment is only available on a private basis.